The Nokia Lumia 521, despite its low-end status, is arguably one of the hottest selling phones in the U.S. A leaked photo tweeted by evleaks reveals that this model is heading to MetroPCS. Considering that T-Mobile offers this model, and the two carriers now are intertwined thanks to T-Mobile's purchase of the pre-paid carrier, it might not be surprising to see this handset branded with the MetroPCS name. Especially since T-Mobile keeps talking about the great migration that it is leading MetroPCS customers to make, over to T-Mobile equipment and plans. The Nokia Lumia 521 is the T-Mobile version of the Nokia Lumia 520 and is essentially the same phone. 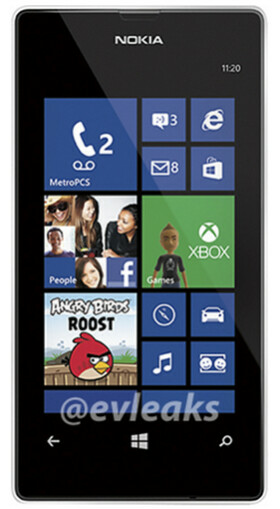 The latter model has recently been crowned "King" of WP phones and is the most searched-for Windows Phone model. Meanwhile, in the states the Nokia Lumia 521 has sold out on HSN, at Walmart and at T-Mobile. HSN yesterday offered the phone for $99.95 with new customers receiving an additional $20 off. Alas, that special price ended as soon as the clock turned 12 Sunday morning. Nice to see Nokia spreading there WIndows Phone's around. Though, I'd like to see them spread more High End one's around to other carriers, too (it doesn't even have to be the "High" high end. Just something more like the 825 or 725, but I digress). Actually for low end, this is a very capable device. Considering the price and all that it can do, it's a steal so long as you don't have unrealistic expectations. I got the phone as my side phone and loving it. It's might not have all the apps like android but give it some time. I remember my first g2 on Tmobile and it started out the same way with not so many apps and look now. It's great to see metroPCS adding a different type OS to their lineup instead of constant Android devices.